Magician Nottingham – I have finally updated my website with fresh content so please enjoy looking round the pages. I have also had some snazzy graphics added to hopefully make the site look more modern and ‘magical’. I am very please with the results. So here at http://www.alexmagic.co.uk there have been some updates, namely some clips of me perfoming live both as and Nottingham adult magician and a Nottingham childrens entertainer. If you have any suggestions to make my website even better, I would love to hear from you. I think it was a time for a change and my blog will feature regular update of my travels as a magician and all of the adventures I have as a magician Nottingham. Nottingham Magician I will be adding photos of both the venues and the parties that I am lucky enough to perform at as well as photography of all the wonderful scenery spotted along the way. See the photo aside of the wonderful English countryside. Magical. I will also try and add all of the feedback I get which is ALWAYS positive and it is always great to hear. I would like to thanks Ade Gower from Monster creations for all his computer skills to update my site. Please have a look at his website ‘monster creations’ to view his varied and superb portfolio of webiste projects. I would like to wecome you all to my site please have a browse around and if anyone has any questions please get in touch and I will do my best to help. 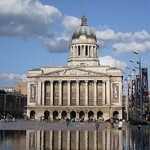 As a Magician Nottingham I am still taking bookings for 2012 for birthday parties, weddings and Christmas parties. You can e-mail me or call me and I try my very best to get back to everyone within 24 hrs. Magician Nottingham Bookings now taken! !